Heavy precipitation and extreme conditions can wreak havoc on productivity, cause disputes with project stakeholders, and tie up your workforce, keeping them from moving on to the next project. But the adage, “There’s nothing to be done about the weather,” doesn’t have to apply to your project. Engineered fabric structures allow work to continue regardless of conditions that would otherwise bring production to a screeching halt. 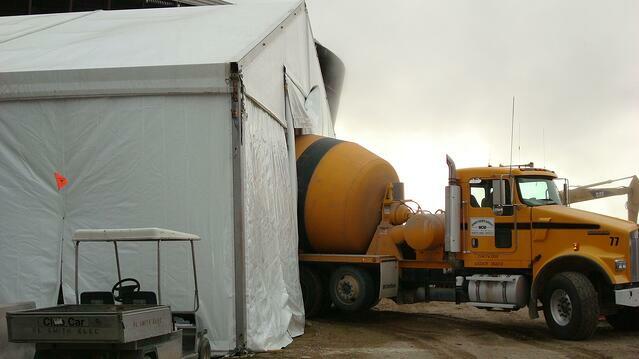 What if you could cover your site so your crews can work through rain, sleet or snow? A qualified vendor can customize your site cover to virtually any size and scale, meaning there’s practically no job that CAN’T be covered, even when you are working with large equipment. Only a handful of companies are capable of engineering structures of this size to ensure stability and safety, so it’s important to vet your vendor carefully. For one construction company, weather-related delays were costing approximately $100K per week at its research and development (R&D) facility. Their project required drilling large holes and filling them with concrete; however, heavy seasonal rains severely delayed progress, as rainwater would fill the holes before the concrete could set. This forced crews to stop work until the rain cleared and created a snowball effect in which delays began to accumulate. This company contacted Mahaffey for a temporary building to protect the worksite and eliminate preventable weather-related downtime. The result? The temporary fabric structure allowed them to complete the project faster, increase operations and even take on new business. Companies often first consider building on-site storage facilities. While this may be a good solution for some projects, typically the need for a structure is more immediate than traditional construction can accommodate. Building a permanent facility is a lengthy process that can take years to complete. You may also have considered off-site storage, but have you considered the associated ancillary costs? In addition to fuel and vehicle maintenance expenses tied to trucking supplies and equipment back and forth, hours of productivity are lost each week when workers travel to and from the storage site. Off-site storage also requires you to double-up on equipment like forklifts and man lifts, versus on-site storage, which allows you to use the same equipment you currently have on your job site in your warehouse. One Mahaffey client recently reported saving $14K a month by moving from an off-site storage to an on-site temporary warehouse. 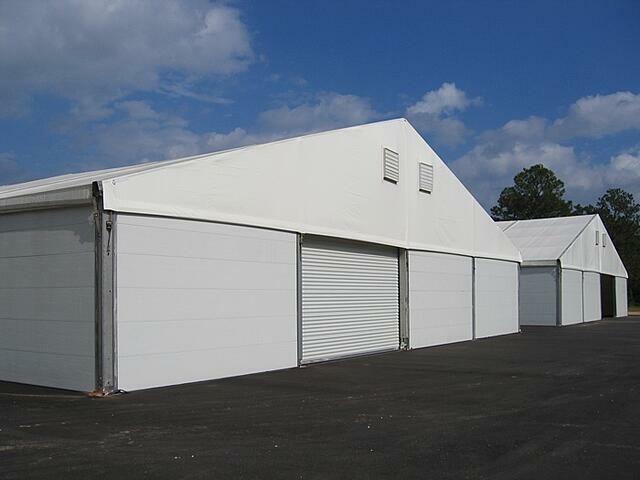 Purchasing (rather than leasing) a temporary structure may also seem like a viable storage option, but purchasing versus leasing can be an investment that won’t pay off over time. 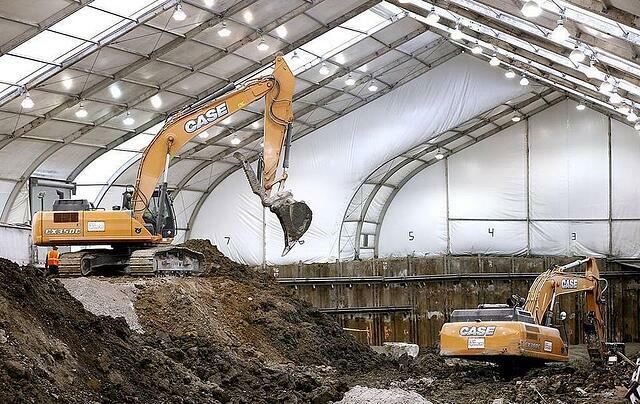 With a purchased fabric structure, you are responsible for removing the structure from the site and storing it. Furthermore, purchased structures aren’t typically designed for relocation and re-use. Leased temporary fabric structures, on the other hand, are engineered, professionally installed and customized for your needs. And when your project is complete, your vendor removes the structure from your site. When working with a turnkey provider, removal service is typically included in the lease agreement, meaning you won’t incur additional or unexpected costs for clean-up. Hidden costs and complications don’t have to threaten the success of your next project. 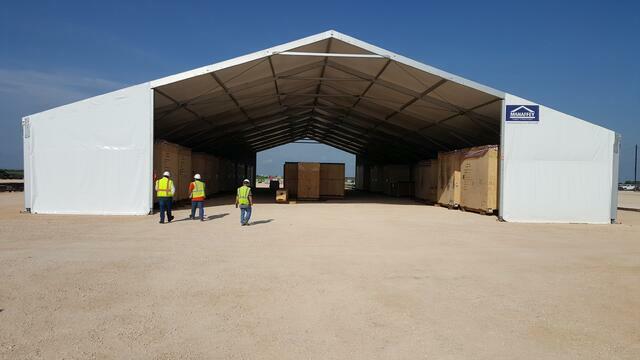 Temporary structures keep your crews working no matter what falls from the sky, and working efficiently with supplies and equipment stored closely to your site. With more time on construction and less time traveling to your site or just waiting for mud to dry, your project is much more likely to wrap quickly and, most importantly, start paying off on your investment. Ready to talk to an expert project manager?